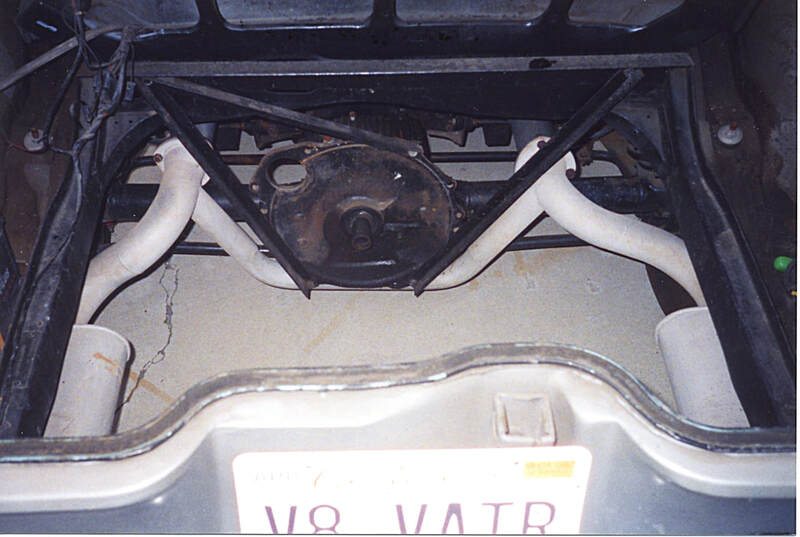 Most owners of Corvair Crown Conversions know the story of Ted Trevor's success at marketing V-8 conversion kits from his Crown Manufacturing shop in Newport Beach, CA 50 years ago. Corvair enthusiasts also know that Ted personally tested all his kit components on his yellow 1966 Corsa No. 1 Shop Car. What many car buffs don't know is that there was also a No. 2 Shop Car. Shop Car No. 1 was born in 1966. Ted had removed the turbo-charged engine from his wife's nice 66 Corsa coupe to go racing at Pikes Peak in his sand buggy. 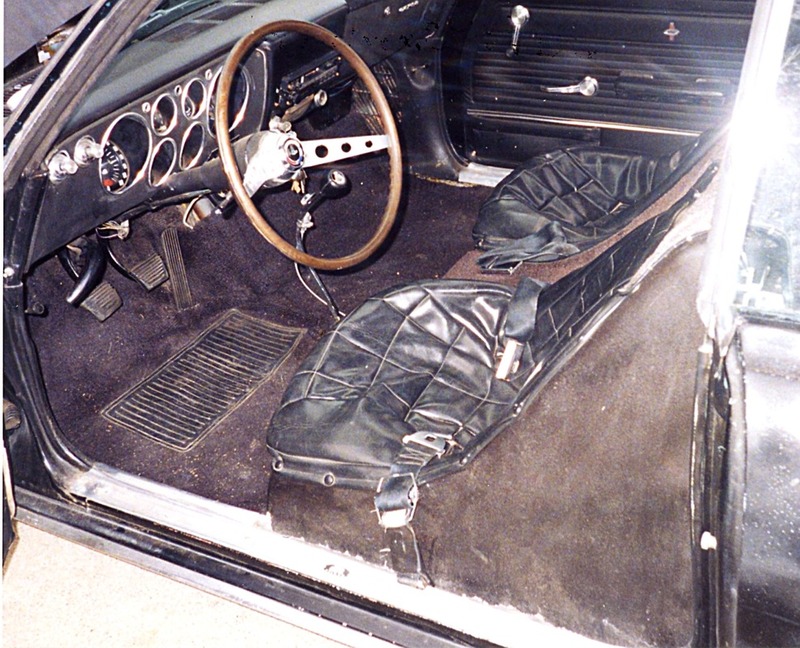 Marion Trevor's nearly new Corvair became the 'test mule' when Ted put together his ideas for installing a Chevy 327 mid-ship in her car. From that point on all new kit additions were tested on this car by Ted. Crown Manufacturing was located at 858 Production Place and Car Life Magazine was headquartered at 834 Production Place. So when Ted would take the Shop Car out on the street to evaluate a new idea, the folks at Car Life couldn't miss the commotion when he went ripping past their offices in his lighting fast Corvair. Articles started appearing in all the car magazines from this point forward. 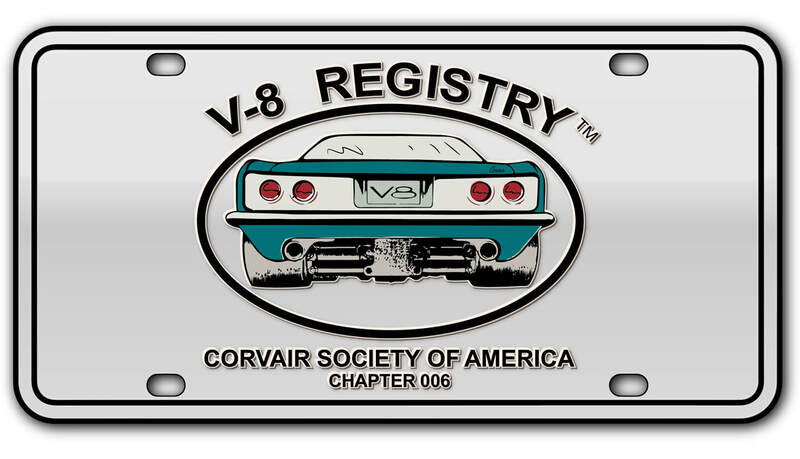 Several of these articles can be read on the V-8 Registry 'HOME' page under the "History" tab. Then a second shop car came along. 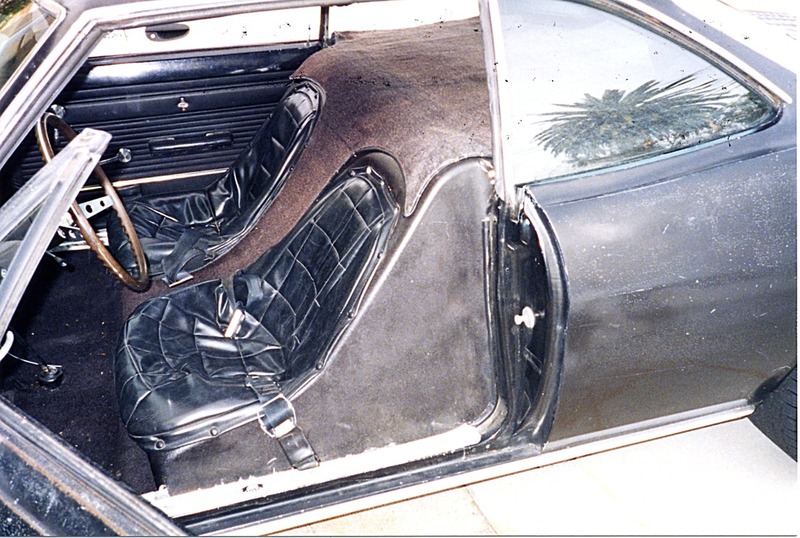 In July 1971 Ted purchased a black 1965 Corsa coupe. This No. 2 Shop Car was affectionately called "The Black Car" and like the yellow shop car this one was also registered in Marion Trevor's name. Here's where some exotic engine testing was initiated. Per Ted, the first V-8 installed was a 427 L88 Big Block Can-Am engine purchased directly from GM. 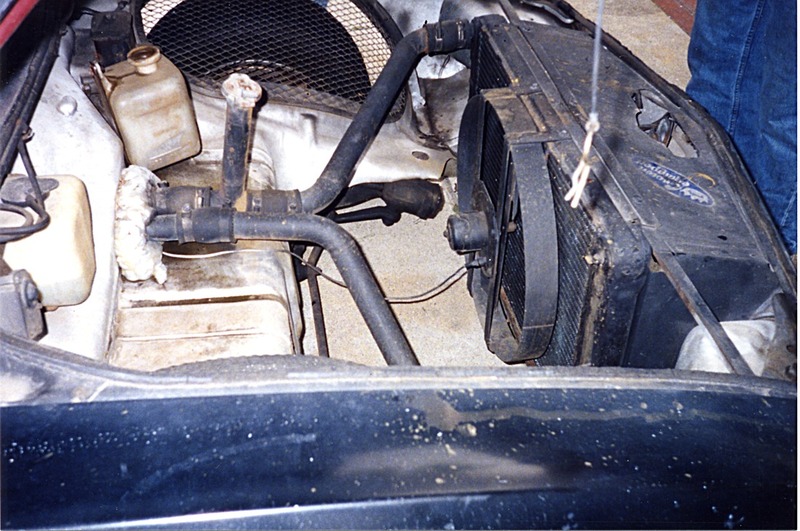 Ted quickly learned that the torque from this engine could fill the Corvair differential case with metal shavings if extreme care wasn't exercised with the right foot. Although this beast was hard to handle, quarter mile runs in the low 12.0 seconds were clocked. Ted tried several other engines over the next two years and the Black Car ultimately was fitted with a Chevy 350 CID engine as its last transplant based on a conversation with Brian Shaneman. Crown Manufacturing continued manufacturing and selling conversion kits up until 1973 and then a change took place. Ted decided, rather abruptly, to sell Crown Manufacturing and move back home to New Hampshire. According to Ted's son Howard, Ted had become rather disillusioned with new OSHA regulations and EPA rules proposed for manufacturing businesses. The manufacturing of conversion kits was only a small segment of his business. Rather than bow to government pressures, Ted decided to return home and pursue his lifelong passion for flying. At this point the disposition of The Black Car becomes cloudy. The yellow shop car went home to New Hampshire with the family in 1974 and is well documented. Howard Trevor still owns his father's No. 1 Shop Car and is currently restoring it. As already indicated, the story surrounding the Black Car becomes murky. However, thanks to a hand written (undated) letter from Ted Trevor to Brian Shaneman we know that Ted sold the Black Car to Derek and Margaret Torley in September 1974. The car changed hands two more times before Brian stumbled upon it in 1993. Brian found the car in a driveway along with 13 other vehicles. Brian said that he had walked past the covered car in a West Lake Village, CA neighborhood for two years before noticing it. One day while walking with his son, they walked past the car, but the wind had blown the cover off. His son ran over to look and called Brian over to see the big motor. Brian knew right away that he had found something special when he bought the car and saw the names of the previous owners on the vehicle registrations. There in plain sight was the name Crown Manufacturing and Marion Trevor as the previous owners. Brian then spent some time restoring the No. 2 Shop Car back as close as possible to the way that he found it. After doing so, Brian contacted Ted Trevor in Meredith, NH and persuaded him to make a trip to California to see the car. Ted's first visit in many years was in March 1996. Then he returned again for a group meeting with other V-8 Vair enthusiasts in April 2000. During Ted's first visit, Brian invited Ted to drive The Black Car for the first time in many years. According to Brian, Ted was like a duck to water. Here's what Brian wrote to me on May 26, 2014. "I searched out Ted for a long time and finally found him and we communicated by fax if memory serves. He was on property that he had his planes on. We talked and became friendly and one day he came to Los Angeles to see his son and we met. Next week he came out to my place and we went for a drive. We went out into the country and blasted around. I asked if he wanted to drive....he was in his 70's and deaf and almost blind. He said sure and we changed places....he sat down, started the car, pushed it into first and jumped on it....about 200 yards up the road was a long, left and he yelled over at me and laughed and said, watch this, and proceeded to do a four wheel drift around the corner, at speed and came out much faster than when he came in...he rowed through the gears and a little into 4th. I recovered my voice and said, OK, enough, he laughed and we drove around for a while and he had a huge smile on his face. He thanked me. I have pictures of that day. Six months later I was having a party and got a call from him and he thanked me for getting him back into the Corvairs. He had gone home and called his son to find the #1 car and towed it home and fixed it up and had just gone for a drive and it had made him very happy. He then came to some V8 Registry meetings and I have pics of that too. I was always pleased about my history in the car and my meeting with him and having been a part of his getting the recognition that he deserved." Brian Shaneman is owed a debt of gratitude for finding and preserving this legacy. He is also responsible for reigniting that fire within Ted when Brian turned him loose with the Black Car. Several years ago Brian decided to sell The Black Car. Age, medical issues and other interests prompted the decision to sell. The car was listed for some time with no takers. Several times I suggested to the Trevor family that this car should be preserved by them, but they considered the asking price too high. Then another V-8 Registry member named Jeff Guzzetta acquired a keen interest in Brian's car. Jeff had just recently sold his Yenko Stinger YS-054 to Jay Leno in August 2013 and was looking for a new ride with some historical significance. I was quick to mention Brian's little gem and Jeff became quite interested. He and Brian talked a number of times. Then just when Jeff was about to make the purchase an insurance claim over another vehicle stole the spotlight and Jeff's attention. Brian suddenly found another interested buyer. The new owner lives in CA and asked Brian to hold off on reporting who bought the car until a full restoration is completed. At the writing of this article, almost two years has passed and no information on the new owner is available. Although Brian has promised to identify the owner when given the OK, the name continues to be withheld. The hope is that this allusive shop car will eventually take its rightful prominence to be enjoyed by those Corvair enthusiasts who treasure Corvairs that 'go fast and handle well'. It should also be revealed here that one other shop car is still looking to be discovered. The No. 3 Shop Car was owned by a Crown client. This Corvair received a complete conversion over a weekend in the Crown shop just to prove that it could be accomplished as advertised by Ted Trevor. The story of this conversion may never come to light, but the search continues. Anyone with information on this car is asked to contact the author. Accompanying this article are some pictures taken in 1996 of Ted Trevor seeing the car after over 20 years and additional pictures taken in 2000 when Ted attended a meeting with other V-8 Registry members in California. We hope to display additional pictures of Ted's No. 2 Shop Car as they become available from previous owners. It is with sad hearts that we remember the passing of Ted Trevor from this world one year ago on December 6, 2016. 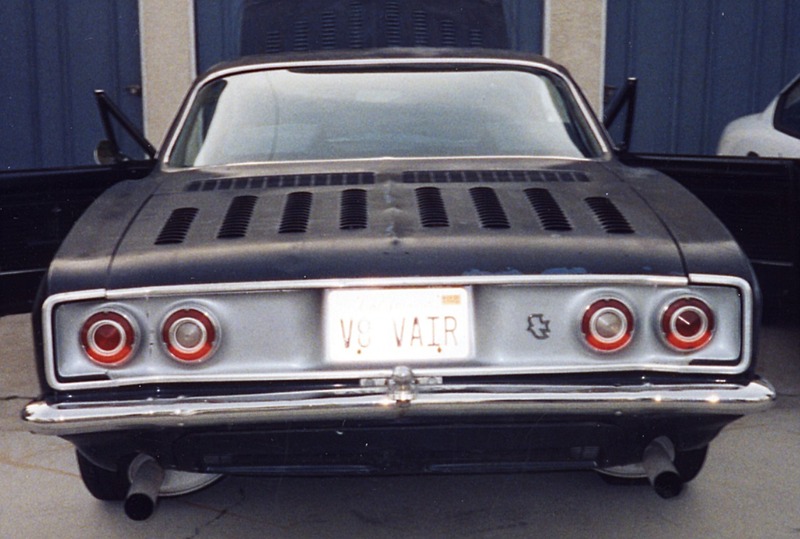 Ted's legacy lives on 50 years later and we all treasure the thought that we are a part of this man's Corvair dream.